What happens to yields when the Fed steps out? 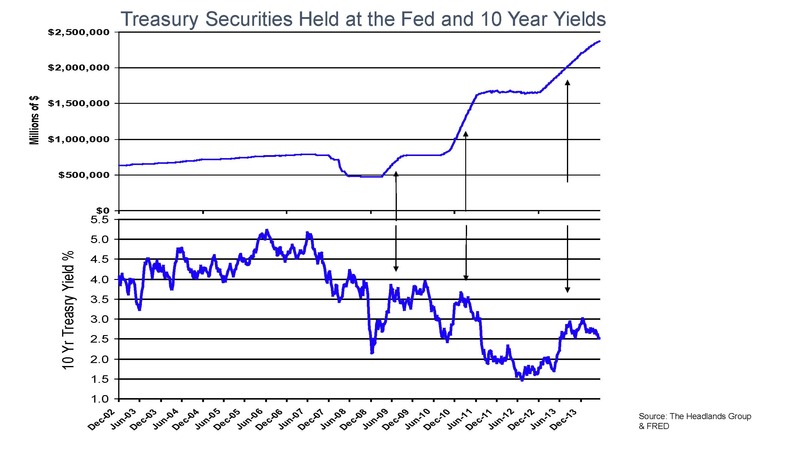 It would be a mistake for investors to underestimate the influence of the Fed on Treasury yields. Investors should expect that when the Fed steps out, market forces will take yields to levels more consistent with economic conditions. The chart above illustrates the three distinct periods of quantitative easing (QE) or increases in Treasury holdings at the Federal Reserve. Below that is the market yield of 10 year Treasury notes. In the first part of the period from late 2002 until 2007 yields rose as the economy recovered. In 2007, the credit crisis and subsequent “Great Recession” sent bond yields sharply lower. As the crisis subsided and the equity market began to recover in the fall of 2009, investors were leaving bonds and returning to equities. Yields rose from crisis lows and as they approached 4%, were met by the Fed’s first buying program. Each of the subsequent two major upward moves in yields from lows were met by significant Fed purchases. Yields subsequently stopped rising and moved lower. As the fed unwinds the QE programs, as they plan to do, we should expect yields to reflect market forces – to be consistent with economic (growth/inflation) conditions and investor risk appetite. If the Fed’s program were unwound overnight, we would expect to see yields between 4% and 5%. That being said, the influences in the economy and the markets of very low long term rates have been widespread – too many for anyone to completely appreciate. The lesson of the Lehman failure is that it is impossible to know all the unintended consequences. We should therefore expect a careful Fed to gradually withdraw so as not to adversely shock the economy and financial markets. Those who have shifted portfolios towards income producing assets in recent years should pay close attention.